Voice and speech are identifiable as belonging to a particular person and convey a wealth of information about you and your individual personality. Listeners draw inferences from voice related to: age, intelligence, education, occupation, regional and socioeconomic background. A fully functioning voice is vital for work and socialising. Any changes to your voice can lead to a loss of ability to function in these settings. Constantly being asked to repeat yourself. Strangers commenting on the sound of your voice. Feeling you need to clear your throat regularly. People may hang up on when you try to speak to them over the phone. Reduced ability to shout or raise your voice in noisy environments. Simple and effective techniques are used to enable you to regain full control of your voice. You will achieve a level of vocal function significantly higher than that of the average speaker. A positive impact can be achieved in the following settings: work, social settings, meetings, school/further education, making and receiving phone calls, shopping, talking in public, interviews, giving presentations, gaining promotions, forming friendships and meeting new people, expressing feelings, standing up for yourself and so on. In her NHS role, Mrs Addlestone is head of the voice service and has extensive experience in diagnosing and treating voice and speech problems. She works as lead therapist with ENT Consultants in designated voice clinics within a hospital setting and also has training in counselling, cognitive behvaioural therapy and family therapy. 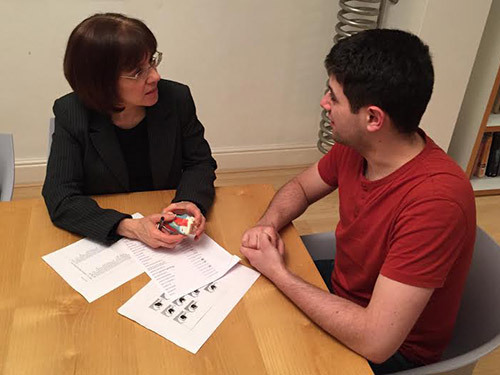 Mrs Addlestone has worked as a lecturer and examiner on the speech therapy graduate course at MMU (Manchester Metropolitan University) and also delivers training in counselling and assertivenss for allied health professionals.